Within Email Studio, you can now directly access tutorial videos on building, testing and sending Content Builder emails. Select the How-To Videos link located next to the Import button in Content Builder to do this. in the Preview and Test step in the Email Creation workflow, you will find HELP bubbles and messages to provide clarification around the Subscriber Preview, Test Send and the Desktop/Mobile Preview steps. When you log into Email Studio, the default view is Content Builder (although you can still switch to Classic Content). You can create shared folders and share content, with specified editing permissions, with other business units within your organisation. To share a Content Builder item, simply click the Share drop-down. You can select the business units to share this email with, as well as the specific editing permission for the recipients. Beneath the SHARED tab, you will see all shared content, both to and from your business unit, and in both shared and local folders. Beneath the LOCAL tab, you will see all content in all folders that your business unit owns. The Content Builder root folder and any child folders are also here. 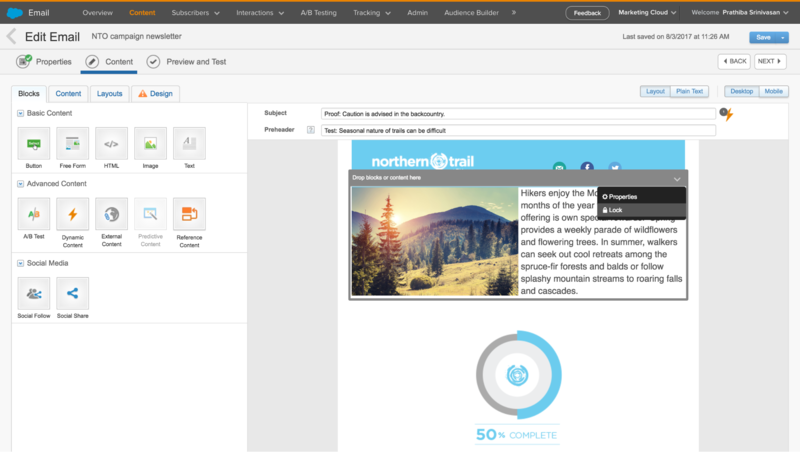 Apply FILTERS by clicking on the funnel icon in the Content Builder grid. 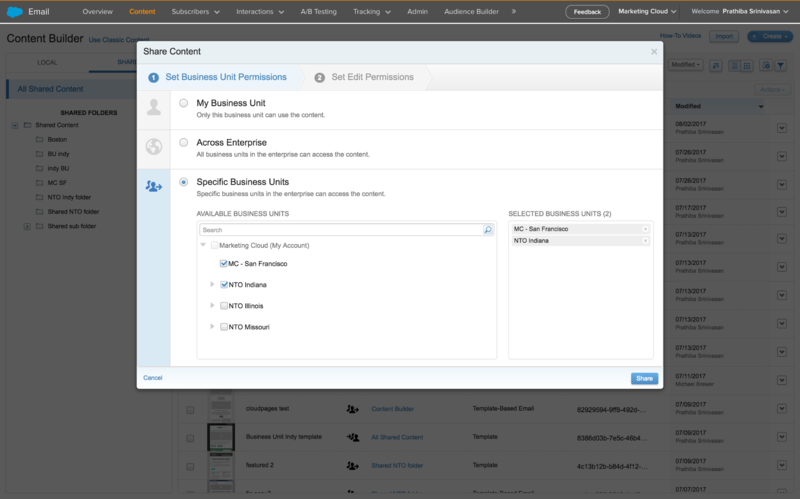 A new sharing option allows for sharing to all current and future business units in your Enterprise, so you will not need to manually re-share content and folders as you create new business units. To enable this setting, you will need to contact your Marketing Cloud Admin at Salesforce. To provide greater Enterprise control when sharing emails across business units, it is now possible to lock content areas directly in emails. The recipient business units can only edit the unlocked areas of the shared email. Note: If the recipient business unit duplicates a shared email, they can unlock the locked content in the duplicate email. When viewing a multi-column email on a mobile device, the columns always stacked from left to right, meaning the left column appeared first. With this release, you can choose between a left-to-right or a right-to-left order. You will find this option under the Layout Settings tab. The Choose New Data Source option in the Personalization toolbar selector lets you choose data extensions or audiences as the source for the list of attributes to insert as well as Subscriber personalization attributes. More information on the August release can be found on the Salesforce website.